I know, I know, Christmas is finished for this year, and I should get over it, right? ;-) I can't help it, I'm still in the spirit of it all. I made this card for my first grand-daughter who will be born in early February! I'll give it to her Mommy and Daddy next Christmas (my son Nik and DIL Alla). 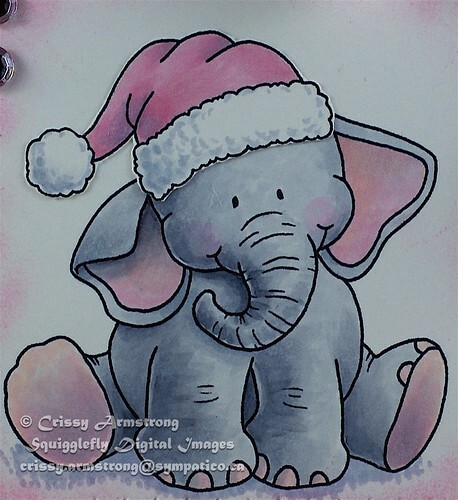 I used "Baby Elephant", a digital image I did for Squigglefly. I also printed off the "Santa Hat" I drew for them too, and cut and pasted it on. What I love about using my digis, is I can re-size them any size I want. Plus I don't ever concern myself with getting a perfect image. The printer does it perfectly every time! I had some fun with some new Martha Stewart punches to create the lacey layers. Which, by the way, were a challenge for me, because they are all white! I really wanted to do white on white, as I always think it looks so elegant when I see other cards in that style. However, I had the hardest time! I kept reaching for pink and grey paper. I'm so glad I disciplined myself and stuck to my original plan, because I like how it turned out! Also, if you have a Scor-Pal, I suggest getting the little Scor-bug. I got it from Scrappin' Great Deals here in Ontario, and it is what I used to do the pierced holes along the sides. It is so easy to do, way easier than lugging the big sewing machine! Though it only creates the holes, it doesn't use thread. You just run it up or down the scor lines on the Scor Pal and suddenly you have a straight row of piercing! It takes mere seconds! I am still getting used to using the Bow Easy (also from SGD), but I'm getting there! That's how I made the triple bows in the corners. BTW, if you are a Canadian paper crafter and you haven't heard of SGD, you are totally missing out! They have super awesome sales going on all the time and really fast and friendly service. I have been ordering online from them for over a year now, and I have never been disappointed. And, I think I have saved oodles of cash with their sale prices (don't ask me how much I have spent in order to save oodles! lol) ! I don't work for them, I am just a really happy customer and I wanted you to have the opportunity to become one too. I hope you had a wonderful Christmas. I know I did! I was spoiled rotten, and I am amazed at the blessings God showered on me, both in material and spiritual blessings. He is just the biggest Giver of them all! PS Thanks Deb for the pink ribbon! Winner of Whimsy Advent Event's last day! Congratulations!! Michelle you won "Jolly Puppy Kisses" from yesterday's Whimsy Advent Event! You were number 11, excluding Whimsy DT members who commented! Be sure to contact Denise of Whimsy Stamps and she'll get that mailed out to you. Last Day of the Whimsy Advent Event!! Merry Christmas!! Last chance to win a prize in the Whimsy Advent Event! All you have to do is leave a comment on this post and I will choose a winner on Christmas Day! I thought it appropro to feature Santa on Christmas Eve as the prize for the day and Denise (the wonderful and generous proprietor of Whimsy) agreed. She is the one who will be giving "Jolly Puppy Kisses" to the winner, so if you turn out to be the lucky one, be sure to contact her with your mailing address! 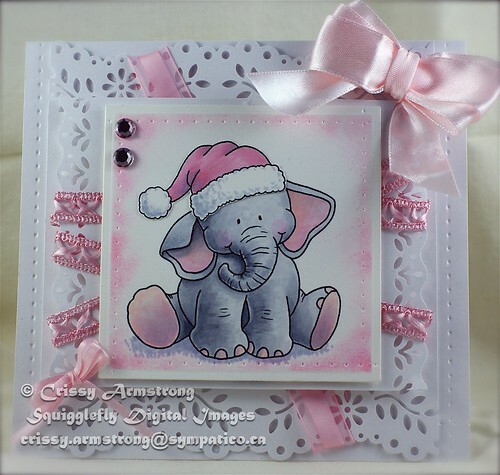 She also did a card today featuring this stamp, so go have a lookie at her fab creation here! I had lots of inspiration for my card. 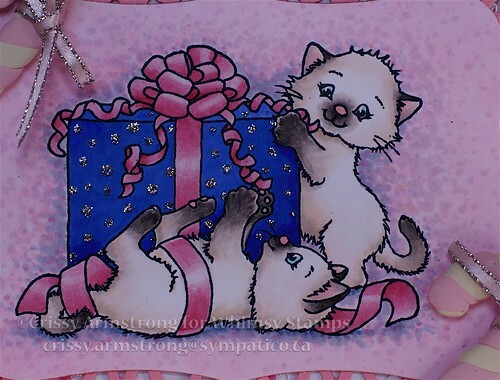 I found this card by Mary Giemza and I totally cased the layout for it, right down to the striped paper, although dp, images and embellies are different. 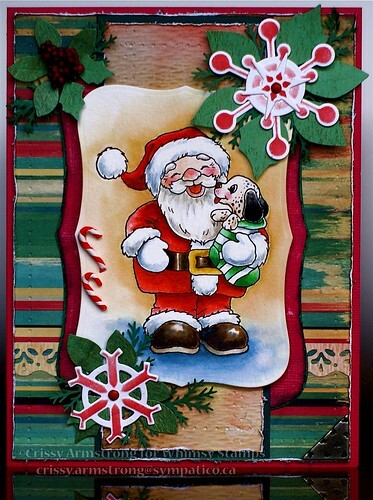 I took more inspiration from yet another card by artist, Michelle, aka MilwaukeeMommy on SCS. I loved the way Michelle did the Spellbinders snowflakes and I copied the way she embossed and inked them. I thought it looked fantastic! 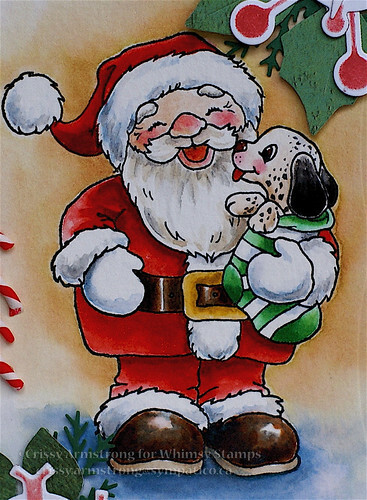 I stamped Jolly Puppy Kisses on Canson 140 lb cold press water color paper using Versafine Onyx Black ink. 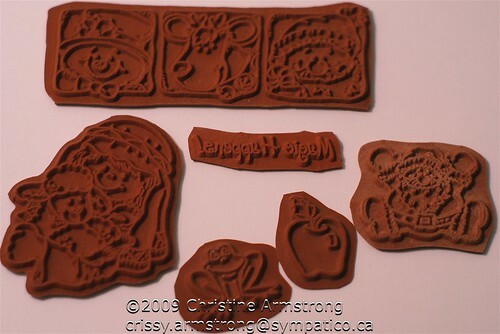 I love how Whimsy stamps give such a crisp perfect image because of the high quality deeply etched red rubber. This time I got out my Twinkling H20's to water color the image, and used a #4 and a #6 water color brush. If you have a couple of good brushes that come to a nice fine point, you can paint the details without worrying about going over the lines. I didn't pay much for them either, under five dollars each if I remember right. If you want to refer to a video demonstration on how I water color, I did one in September here. Oh, btw, I painted the black spots on the puppy to make it a Dalmation. It does not come with spots! I hope you all have a very relaxing and happy holiday this year, and Merry Christmas to you! God bless you! Here is the winner of yesterday's draw for Whimsy Advent Event! Love this kitty image, beautiful colouring nd those candy canes look like marshmallows, so yummy! Congratulations ribenaruby! 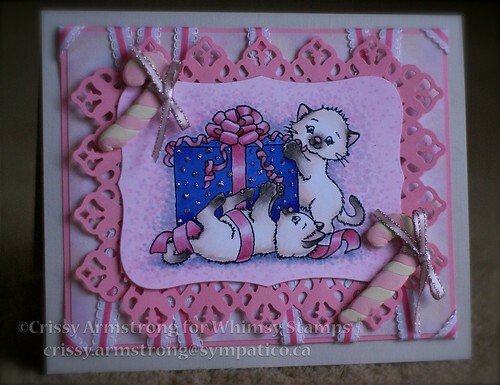 Please contact Denise Lynn of Whimsy stamps so she can send you "Very Present Helpers". I hope you have fun with it! Happy Sunday! I am so glad you stopped by today, because today is Day 20 of the December Advent Event over at Whimsy Stamps! Every day until the 24th, Whimsy is offering up a prize to someone who leaves a comment on the DT member's post who is hosting the contest for that day. Today, that hostess with the mostess is me (even though I'm not really a member of the DT)! So leave a comment here to be eligible for the daily prize giveaway which is the stamp I chose to use on my card today, "Very Present Helpers". I will choose a random winner on Monday Dec 21, so check back here to see if you're the lucky one! I stamped "Very Present Helpers" with Tsukeneko Tuxedo Black onto Gina K's Pure Luxury cardstock. Now, I love the markings of a Siamese cat, and it was a cinch to do with Copic markers. I colored the cat's whitish areas using a combination of R000, E0000, YR00 and E30. Then I used some warm greys on the ears and paws: W1, 3, 5 and 7. At first the lines of demarcation between the light and dark fur was very distinct. So, to get a really soft blend of the warm grey into the off-white fur, I gently brushed the tip of one of the light colors I was using for the whitish areas (R000) onto the tip of the grey (W3). My daughter saw this and she shrieked, "You just ruined your marker!" Ah, but no, darling daughter, I said. ! Not with Copics! You can do that and not worry, because as soon as you start to color with it, the dark color comes off the tip of the light marker! In fact it cleans off completely, leaving no stain! And that is why it is a perfect method for blending from a very light to a very dark color! Perhaps the in the new year, I will have the time to do up a video showing this fun technique. I would like to try! I made the pink and white candy canes with Sculpey clay. I am happy as can be with modeling clay in my hands. It is fun stuff! I thank Niki Estes for inspiring me to use ribbon on the corners like that! And I thank Deb (88 keys) from SCS for the ribbon, which she gave me a loooong time ago. I hope to chat with you soon! Thanks for coming by, and God bless you! Winner of my Christmas Candy!! I would love to win some high hope stamps, I do not own any yet so it would be great if I won :). Also, your card is just stunning, your coloring is fabulous. December 12, 2009 7:23 PM"
Contact me with your mailing addy, Becky, and I'll get these stamps mailed to you! Congratulations! Wags 'N Whiskers Blog Hop and new release! I am really excited about my new illustrations for this release with Wags 'n Whiskers! You will be able to get a jump start on your Valentine cards with these stamps, but really I made them versatile enough to use all year round! I am still catching up with drawing (our move to a new location really set me back, time-wise) and so unfortunately, I did not get time to make a card or to even color one of these new stamps :-(. But Nikki and Lacey put this picture together showing all eight new images! 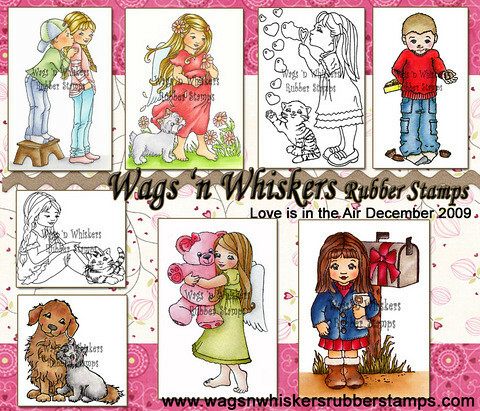 There is a great blog hop on today, and all the stamps are ready to ship immediately! They are high quality deeply etched red rubber, you won't be disappointed. If you want a chance to win some for free, join in the blog hop starting here! Don't forget to scroll down one post and join in my blog candy contest too! It's over tomorrow evening (Sunday). I've got lots of free rubber up for grabs! Well, back to the ole' drawing board for me! Well I have been a busy beaver, setting up my new digs, and trying to keep up with illustration deadlines. On top of that, my dear Mom in law has been very ill with pneumonia. She is on the mend now, but she gave us all a real scare, and was in critical condition for about a week. Thankfully, she is recovering well from her illness now. Needless to say I still have not had any crafting time, and I miss it so much! That is why I have pulled out an oldie but a goodie, from last year. 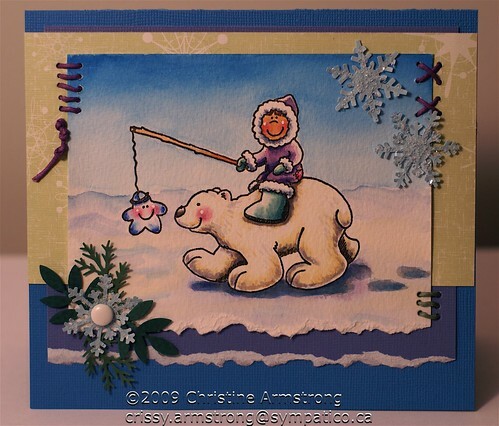 I made this card last winter using one of the first illustrations I drew for High Hopes Stamps back in 2005. 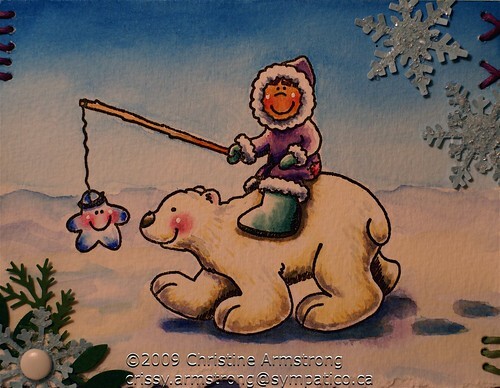 From what I remember, I stamped the polar bear image on water color paper and used regular artist water colors to color it. Martha Stewart punches and Twinklets Diamond Dust on the snowflakes. But the real reason for this post is to offer you some Christmas Blog Candy! I have had some extra High Hopes Stamps sitting on my desk just waiting to go to a good home! I'm not going to make you do anything for this candy, other than to let me know you want it! Just comment on this post and your name will be entered into the draw. Just for fun and if you wish to share, tell me a favorite Christmas memory. I will choose a winner by random.org on Sunday Dec 13. Enter only once, please! One of my favorite Christmas memories is the taste of my Mom's Christmas baking. She was phenom in the kitchen, and her lemon bread and mince meat pie were off the charts awesome! These are the stamps I will be giving away. If you are the winner, don't forget to contact me with your mailing details! I will ship international. Good luck and have fun!